Australia continued their excellent record over Wales winning an attritional Test match at Twickenham 15-6. The game was dominated by the referee’s whistle and the boots of the two stand-offs. Flyhalf Bernard Foley, the hero against England, kicked all 15 points for the Wallabies, who led 9-6 at half-time. Dan Biggar’s two penalty goals were all that Wales had to show despite a ten-minute spell of sustained pressure on Australia’s try-line, who only had thirteen players on the field. Wales could not make a two-man advantage count in the final quarter of the game when yellow cards for Will Genia and Dean Mumm looked to have been costly. Much had been made of Australia’s dominance over Gatland’s team in recent years, not having beaten the Wallabies since 2005. The games are usually close affairs – the past five Tests seeing an aggregate points margin of 14 points in favour of the men in gold. This was no dead rubber; both sides having already qualified for the quarter-finals, however, the loser would have to play the vastly improved Springboks, the winners, Scotland. 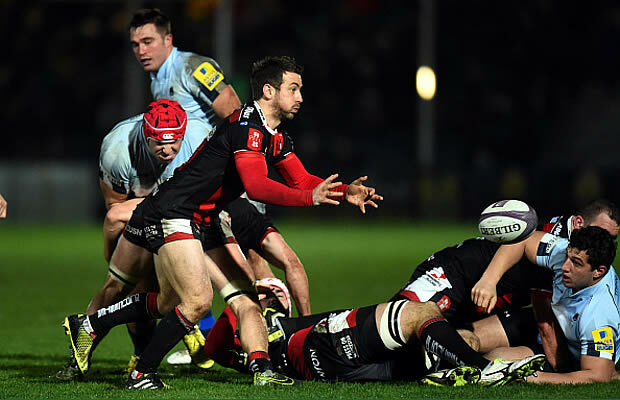 The first half was scrappy with both teams falling foul of referee Craig Joubert. The battle between Sam Warburton and David Pocock, a treat for the lovers of the breakdown’s chief protagonists, would ultimately decide the outcome. Wales early penalty from Biggar was cancelled out and raised once by Foley for a 6-3 lead after 31 minutes. Careless penalties at the breakdown and some poor handling were a theme throughout the half. Biggar levelled the scores after Aussie skipper Stephan Moore was marched back ten metres for back-chatting. Taulupe Faletau was then penalised for offside and Foley made it 9-6 at the break. The ill-discipline continued in the second half. Foley extended Australia’s lead to 12-6 on 50 minutes after Faletau was again penalised, this time for a tackle around the neck. Wales started to get a foothold on the game and Joubert had to warn Moore as his side started to concede a succession of penalties. Scrumhalf Will Genia was first in the sin-bin for cynical play after failing to let Gareth Davies take a quick-tap penalty. On the hour Wales thought they had scored but TMO Shaun Veldsman did not award the five-pointer. Eventually Joubert reached for a card and sent Dean Mumm to the bin for repeated infringements, this time for tackling Alun Wyn Jones in the air. This was the cue for the Welsh to batter the Australian line with a two-man advantage. Australia held firm, pushing Wales back. George North was then held up by Ben McCalman, on for Genia, after a break on the right-hand touch-line but the Wallabies defence was magnificent. From the scrum Wales went piled on the pressure, but their opponents would not break. Seven phases on the Aussie try-line resulted in another five-metre scrum. Would Australia eventually concede? Could they hold-out? A messy scrum led to another Wales penalty, this time Biggar kicked to the corner. It was now fifteen versus fourteen; Wales won the line-out, spread the ball to the backs but conceded a penalty thanks to some immense defence from Adam Ashley-Copper. 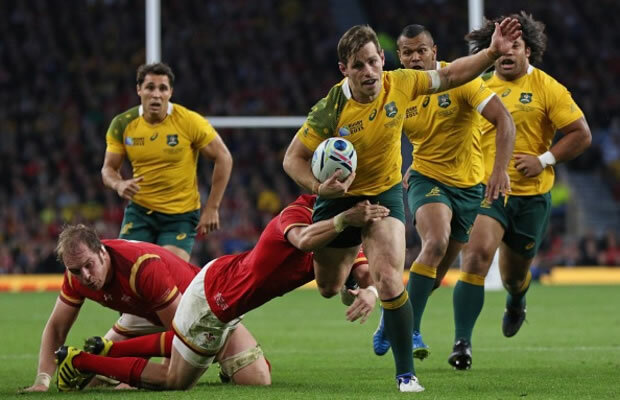 Australia had made 117 tackles to Wales’ 46 after 69 minutes – the phycological advantage gained from their spirited defence was monumental in the outcome of the Test. With ten minutes remaining, it was Australia’s turn to attack. A break from Israel Folau came to nothing when the fullback slipped in the Welsh 22m. The Wallabies regathered, went left, but the play broke down. However, Australia gave themselves breathing space when Foley kicked his fifth penalty to stretch the lead to 15-6. During the spell with thirteen players on the field, Michael Cheika’s side did not concede a point and none in the second period. Matches are won on big defence and the 20 minute spell without two players, ultimately the difference between winning and losing. 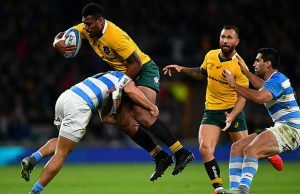 15 Israel Folau, 14 Adam Ashley-Cooper, 13 Tevita Kuridrani, 12 Matt Giteau, 11 Drew Mitchell, 10 Bernard Foley, 9 Will Genia, 8 David Pocock, 7 Sean McMahon, 6 Scott Fardy, 5 Dean Mumm, 4 Kane Douglas, 3 Sekope Kepu, 2 Stephen Moore (captain), 1 Scott Sio. 15 Gareth Anscombe, 14 Alex Cuthbert, 13 George North, 12 Jamie Roberts, 11 Liam Williams, 10 Dan Biggar, 9 Gareth Davies, 8 Taulupe Faletau, 7 Justin Tipuric, 6 Sam Warburton (captain), 5 Alun Wyn Jones, 4 Luke Charteris, 3 Samson Lee, 2 Scott Baldwin, 1 Paul James. Replacements: 16 Ken Owens, 17 Aaron Jarvis, 18 Tomas Francis, 19 Jake Ball, 20 Ross Moriarty, 21 Lloyd Williams, 22 Rhys Priestland, 23 James Hook.